Neutrik recently posted a safety bulletin regarding their TRUE1 Connectors. 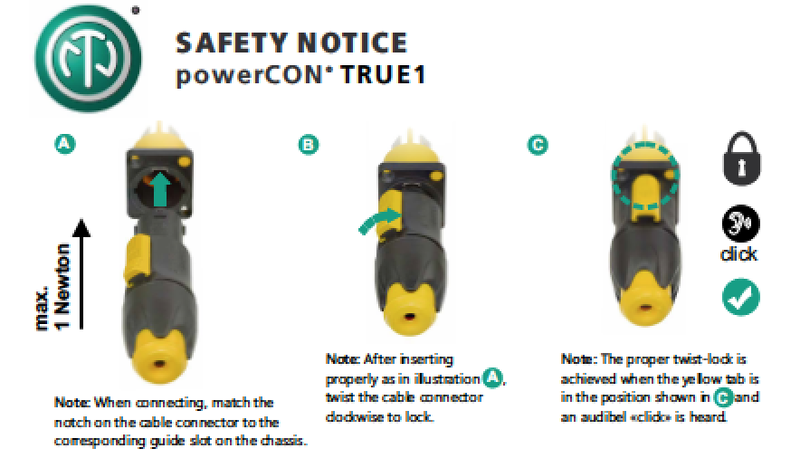 Please regularly check the condition of your powerCON TRUE1 connector system (cable connector & chassis) for clear signs of wear and tear. Through improper use and the excessive use of force, the encoding lugs and guide slots in the connector system can become so severely worn or damaged that it is possible to insert the cable connector the wrong way. However, when inserted the wrong way, the cable connector should not twist-lock into place. Here is a link to download the complete PDF document for your reference.